Is it possible or worth it for Christians to be involved in politics when systems are corrupt and broken? If you’re like most Americans you probably haven’t been following the elections in the country of Malawi. Conversely I’ve been glued to my iPad waiting for the results and witnessed the drama that has unfolded over the last few weeks. In many ways, it is a typical story of African politics: filled with mystery, comedy and tragedy. You have the incumbent President Joyce Banda, under attack for a scandal called CashGate, facing fierce international criticism led by pop icon Madonna. One of the primary opposition candidates, Professor Arthur Peter Mutharika—whose brother was the fourth president of Malawai (Bingu wa Mutharika)—has also been accused of corruption. And finally—believe it or not—you have a Pentecostal Pastor, Dr. Lazarus Chakwera, as the other leading candidate. Evangelism Explosion president Dr. John B Sorensen prays over Pentecostal Pastor Dr. Lazarus Chakwera’s political campaign during a OneHope event in February 2014. This is why I’ve been so interested in the outcome. “Doc” Laz is a friend of mine. And for the last decade or so we’ve talked, dreamed, prayed about and worked toward what it means to bring integral leadership to developing countries. 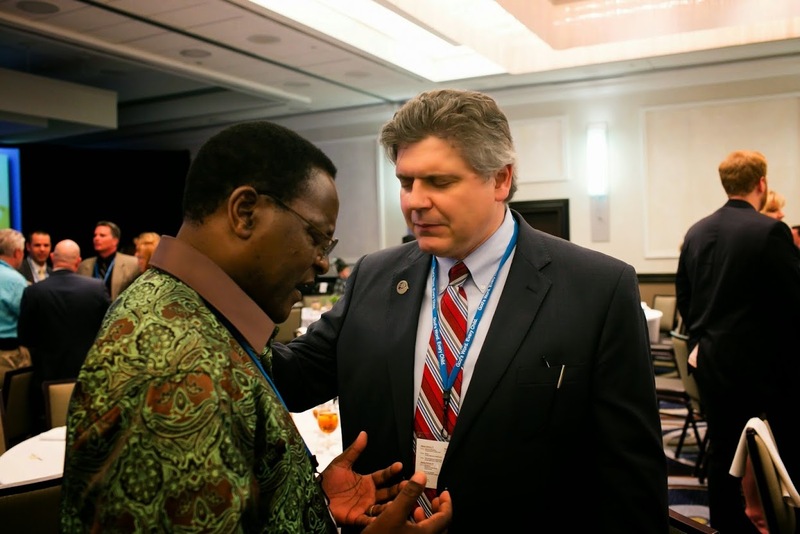 Together we helped establish the AMAB, Africa Ministers Advisory Board, a yearly meeting of African government leaders who seek to live out the Gospel in a faithful way while serving their respective nations. This is easier said than done, and through the years Doc has felt a growing compulsion to resign from his pastoral responsibilities and dedicate himself to serving the Lord as a politician. He was asked last year to represent the Congress Party of Malawi in the election that was just held. I had mixed feelings about this theologically and sociologically. There aren’t a lot of good examples of Christians holding the highest office of the land in developing world nations. Rios Monte of Guatemala is currently on trial for genocide and war crimes. Fredrick Chiluba of Zambia was accused—and tried in court—for using millions of dollars of public money on his wardrobe and other extravagances. President Yoweri Museveni of Uganda showed promise as being a good Christian President, but has slid into increased megalomania and corruption. Former Ghana President John Mills, who died five months short of completing his first term, and Paul Kagame of Rwanda, have perhaps been our best examples of being honest and upright in presidential leadership. It begs the question: Can you be a President and a Christian of a country rife with corruption, nepotism and cronyism? My friend Doc won’t be able to answer that question this time around. Yesterday Professor Mutharika was pronounced as the new President-elect; Dr. Chakwera placed second. The election played out as you would expect from a corrupt nation: widespread fraud, rigging, ballot stuffing and any number of corrupt antics. The election committee wanted to do a recount, but under the Constitution they had to declare a winner within 8 days. So even though seven out of ten election Commissioners expressed reservations, Mutharika was declared the winner. The system didn’t work. And we will never really know the true results. Perhaps at this juncture we can’t answer the question if a Christian can exhibit his faith after winning office. But Dr. Chakwera is showing us how to exhibit a faithfulness to the teachings of the Bible and Christian character even when you don’t win. Perhaps his submission to the process, as dysfunctional and broken as it is, provides hope that democracy might still prevail if he and others can stay engaged in trying to make the system work through resolved, yet peaceful engagement. Today at 6.15am, I called the President-elect, Prof. Arthur Peter Mutharika, who has since been sworn in as the 5th President of the Republic of Malawi. I called to congratulate him and to wish him well. Whether the injunction that had been obtained by Hon. Friday Jumbe preventing MEC from conducting a recount was valid. The court ordered that the injunction was wrongly obtained and discharged the injunction. The court was asked to rule whether MEC had the power to order a recount and the court decided that MEC had the power to do anything that it needs to do to arrive at a free and fair result and that includes a recount of ballots. On whether MEC could postpone the announcement of results beyond the 8 days period the court ruled that the 8 day period ought to be reviewed because it can lead to injustice. The court lamented the predicament it found itself in but nonetheless said the period of 8 days could not be extended. We thus found ourselves in a situation where the court said a recount which MEC said had to be done to arrive at a credible result had to be done in one and half hours. In making the announcement the Chairman of MEC stated that “some of the Commissioners of MEC had expressed reservations at some of the results as received by MEC” but stated that the due process that had been followed did not allow them to satisfy themselves by way of a recount. He stated that the rule of law compelled them to announce the results and as Commissioners they had to obey the law. We are aware that it was not just some of the Commissioners but the majority, seven out of ten that expressed reservations at the determination. In fact the 7 Commissioners issued a communique to the effect that they could not make a determination without a recount of the ballots of the Presidential Vote. We find ourselves therefore in a position where on MEC’s own admission the result of Presidential vote is flawed but they are compelled to announce it and on that basis the President of Malawi declared. This is a very sad situation where our democracy and the will of the people of Malawi are held to ransom by virtue of some technical phrase of law that says the result must be given in 8 days regardless of glaring fraud and irregularities. We are aware that the result announced yesterday can be challenged and in fact it ought to be challenged but to what effect and for what benefit to the Malawian people. The institutions put in place to safeguard our democracy, MEC and the Judiciary, have confirmed their inadequacies. We have always believed that to every wrong there must be a remedy but our experiences since May 20 tell us otherwise. It is therefore with the heaviest of hearts that I wish to thank all the supporters of the MCP and all people of good will who supported our cause, in cash, counsel and prayers. It was and remains a good cause. In eight months we ran a formidable campaign that gave hope to many Malawians that a truly transformative development agenda was possible. We stuck to our values. And we have no regrets. Are we disappointed?? Yes!! Are we discouraged?? No!! We believe we did not lose. The systems failed us and all this happened in full view of all Malawians and the world. And we believe that Malawians would still have loved to know what really happened. We now bow to the reality of the present situation and say let us move on. Let us keep peace. There can only be one President at a time. It is my hope that when history comes to judge me, the Chakwera campaign and what happened in this election pertaining to the declaration of the Presidential winner it will judge us kindly. We congratulate and wish the new President well. We pray for him and our country and may God continue to bless Malawi and keep it a land of peace.